Solimano, Andre`s (2010). International Migration in the Age of Crisis and Globalization: Historical and Recent Experiences. Cambridge University Press. ISBN: 978-0-521-19425-9. ©Andre`s Solimano 2010. In the globalized era, the international migration has become prominent area of discussion in academic field. The global forces intend to pace up the flow of money, resources, workers and society from one geographical boundaries to another. The international migration of people has been a main feature of the global economy of today and past. For last few decades, the international migration of workers, professionals and ethnic minorities have been increasing due to socio-economic and political pressures. Under such conditions, the migrants’ rights and safety remain ambiguous in the destination countries. Therefore, the international migration, both as a process and condition has become challenging and precarious for both country-of-origin and country-of-destination. 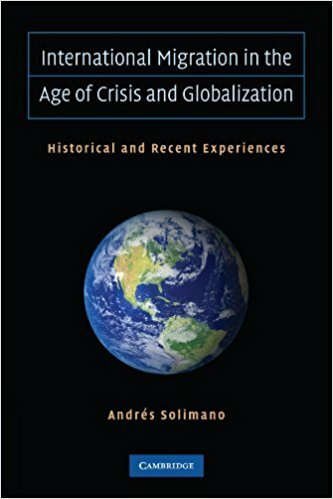 The book titled “International Migration in the Age of Crisis and Globalization”, written by Andre`s Solimano is the Founder and President of the International Center for Globalization and Development in Santiago, Chile. He has discussed the international migration with the historical cases and recent evidences comprised of various country-examples from the mid-19th century and early 21st century. It also conceptualized the push and pull factors of current migration waves and their impacts on the development of source and receiving countries. The author has analyzed the migration experiences under the certain time-frame, political structure, cost involved in migration, socio-economic pressures and so on. These issues are relevant in every phase of time even in times of economic crises as well as economic growth and prosperity. The book consists of seven interconnected chapters dealing with theoretical underpinning and empirical experiences of people and societies. The author has given detailed introduction of the global migration history and discussed the major characteristics of the international migration. The first chapter examined the trends, themes and stratification of international migration, highlighting the major drives and incentives for mobility. It also discussed the role of visas, walls and deportation to allow easy and smooth immigration of people vis-a-vis to discourage the immigration from sending countries. The chapter also discussed the shift in political power and ideological differences which plays critical roles in the flow of immigration. It also examined the eight critical themes of international migration which resulted in the conceptualization of international migration. Such eight critical dimensions underline the international migration in the following areas: contentious or consensus issue, economic prosperity or economic crisis, consequence or mitigation of income disparities, goods and capital or people are important, talented elites or workers are more mobile, economic success in north or economic failure in south, irregular migration or fragmentation of global labour markets, multicultural framework for regulating international migration. The second chapter examined why people move, due to international differences in- income, wages, payments, economic cycles, policies, social networks, financial crisis, political instability, civil war, dissolution of empires and so on. The impact of economic development on the standard of living, social services, community safety, health, environment and overall social securities for both individual as well as society. The role of development organizations, philanthropy and investment in the communities back home. It also analysed ‘why not’ people migrate which includes financial, family and social costs mainly. It also put forth the dimensions which influence the decision to migrate, other than income. The third chapter addressed what happens when people migrate which discussed the dilemma of legal ambiguities, denial of rights and restrictions on immigration resulted in the illegal migration. Also, the internal grudge among natives and immigrants for the employment opportunities, natural resources and capital affecting the demand of more capital than people in globalization. Furthermore, the dilemma of migration compatibility and income convergence in view of size of migration. The challenges of brain drain and brain gain in tandem with migration outflow and inflow in the sending and receiving countries respectively were discussed. The impact of economic growth in sending countries in view of talent circulation, remittances, new development effects have been also discussed in this chapter. The fourth chapter dealt with the policy regimes and economic imperatives which influences the mobility of capital and people. The author has discussed the economic liberalization in the first wave of globalization for labour and capital markets during 1870-1914. He talked about the major traits, nature and role of global capital market in the labour-flow from developing countries. He also discussed the de-globalization phase during 1913-1945 wherein economic instability (western and developing countries) and political turmoil (in developed nations bloc) led to restricted immigration flows. Furthermore, the book emphasized the rising debate over nationalism vs. internationalism during 1945-1973, corresponding with the Bretton Woods era. The chapter also talked about the second phase of globalization with mass labour migration towards Western Asian region from South Asia. The chapter analysed how international capital markets have interacted, shifted and reshaped under certain political events and policy regimes. The chapter explained that how the nature of international trade, capital markets and free labour mobility took place from first wave of globalization to second phase of globalization. The fifth chapter deals with case of Latin America which was discussed as an example of economic development, political crisis, poverty and remittance gain. In this chapter, the author has discussed the development gaps between Latin America and Europe which reinforces the formation of New world in the 19th century. Under this broad theme, the author has talked about the country-cases of Argentina (shift from massive European immigration to Emigration to Europe), overtaking immigration in Latin America in the late 20th and early 21st Centuries. The author also discussed the macro-economic and financial crisis, inconsistent growth and recurrent political crises which led to the emigration from Latin America and the Caribbean towards the one country i.e. ; United States. However, since 1990s, the flow of people from Latin America shifted towards Spain and some other European countries. The chapter further discoursed over the socio-economic demographic characteristics of Latin American migration which promulgated the emigration of women and educated persons. It also studied how internal diversity in developmental levels which helped to explain intra-regional migration and the effects of remittances gain for the domestic economies in Latin America. The sixth chapter focused on who migrates particularly the highly talented, highly educated, professionals and entrepreneurially oriented people. The chapter conceptualized the concept of elite, knowledge and talents in the current economic scenario. It raised the debate on the significance of international political relations, capital markets and value of talents in the sending and receiving countries. The chapter also discussed where the talent moves, where the health and cultural talent moves, why there is mobility of talent in international public organizations, multinational corporations and international banks. The chapter has brought the debate on and what they offer- employment opportunities, earning, rewards, promotion and better career options to talented workers. It critically addressed the debate over the segmentation of labour market based on their skills, knowledge and experiences. This has furthermore raised the discussion over the best vs. worst, talented vs. looser, winner vs. failure under the conditions of economic gains, reward system and profit terms. The chapter has put forth the important topics of return flow of talented persons, talent circulation and outsourcing jobs, unnoticed, unseen and unrecognized (in terms of rewards, earning and employment) contribution of youths in culture and arts in the world. The seventh chapter dealt with the conclusion inclusive of summary of the salient arguments and critical issues of the book. This chapter advocated a fair and orderly international migration process. The author suggested for a global social contracts, legal framework, conventions and recommendations particularly for management of international migration and disseminate the responsibilities to the various agencies of sending and receiving countries. The chapter forecasted the future migration scope in the world and proposed to fill up the institutional vacuum through various contracts, policies and programmes. The chapter recommended the state, civil societies and non-govt organisations to bring new policy measures and programmes for more inclusive and accommodative migration approach. It also proposed the international organizations for more proactive, dynamic and effective approach to address the issues and challenges of international migration today. The book has relevance with the current debate over international migration worldwide. The book provides a detailed historical background of the international migration trends of people with support of the changing political and economic regimes. The book is well organized and executed with detailed reference lists for comprehensive readings related to migration studies. It also analysed some critical issues such as illegal migration, economic crisis, brain drain, political turbulence. The book, however, does not discuss the issues of exile, forced migration, women’s irregular migration and human trafficking per se. The book does not discuss the critical role of state and international bodies in terms of unskilled workers’ migration, human trafficking, absence of human rights and challenges of migrants society in receiving countries. The book did not address the migration history of Africans to the European countries. Nevertheless, the book contributes in the knowledge capital of migration studies and provokes readers to think on capitalism, internationalism and globalization. Reviewed by Monika Bisht, PhD Research Scholar, National Institute of Educational Planning and Adminsitration (NIEPA), 17-B Sri Aurobindo Marg, New Delhi-110069, India.